Pearl Chavez (Jennifer Jones) is considered by everyone as a bad girl foredoomed to an unhappy end. She is taken into the home of wealthy, greedy rancher McCanles (Lionel Barrymore) and his kindly wife Laura Belle (Lillian Gish), who was once the sweetheart of Pearl's recently executed father (Herbert Marshall). Almost immediately, Pearl becomes the object of an emotional tug-of-war between McCanles' virtuous son Jesse (Joseph Cotten) and wicked ne'er-do-well offspring Lewt (Gregory Peck). After killing a man (Charles Bickford) who'd tried proposing to Pearl, Lewt becomes a fugitive, secretly working to undermine the railroad that threatens to cut across McCanles' land. Level-headed Jesse tries to negotiate with the railroad men, and as a result is ordered from the ranch by McCanles. Meanwhile, Pearl, tired of being told how bad she is, decides to live up to her reputation. 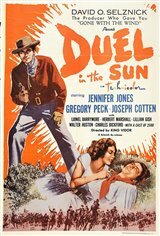 Duel in the Sun was based on the novel by Niven Busch, who'd written the work hoping that his wife Teresa Wright would play Pearl--but that was before Selznick fell in love with Jennifer Jones.